In writing about Jesus, I have depended most on the consensus of the most respected scholars, both believers and non-believers. The scholars I found most useful in maintaining a balanced view are listed first, followed by others I have read. I have used relatively few christian and sceptical “apologists”. Richard Bauckham: Jesus and the Eyewitnesses: The Gospels as Eyewitness Testimony. A thorough and fascinating study of the eyewitness basis of the gospels and how memories and important information are handed down in oral cultures. Jesus: a very short introduction – the best short summary I have read of the historical information about Jesus. Marcus Bockmuehl, Cambridge University: The Cambridge Companion to Jesus. A useful reference because it contains essays by a number of scholars on a variety of important topics. Maurice Casey, Emeritus Professor of New Testament, University of Nottingham: Jesus of Nazareth. A goldmine of information by an expert in the Aramaic language, which Jesus spoke. John Dickson: The Christ Files, A Spectator’s Guide to Jesus and Jesus: a short life. 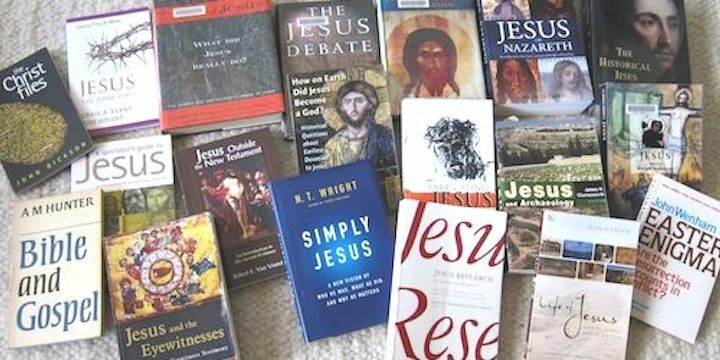 Good, simple and even-handed references by a historian and fair-minded christian on the evidence historians use to understand the life of Jesus. Bart Ehrman, University of North Carolina: Misquoting Jesus, Jesus Interrupted, Did Jesus Exist?, How Jesus Became God and Forged. Popular books written for the layperson by a respected and sceptical scholar, whose conclusions sometimes slightly overstate his case. Craig Evans: Fabricating Jesus. A useful summary of the reasons why scholars generally don’t accept many novel approaches to Jesus and history. Michael Grant: Jesus: an historian’s review of the Gospels. A balanced account by a respected historian of the Roman Empire, who used the same historical methods in studying Jesus as he used in his other works. A M Hunter: The Work and Words of Jesus. An easy to read, scholarly and inspiring summary by a Scottish theologian. Also useful are his The Parables Then and Now and Bible and Gospel. Larry Hurtado, Edinburgh University: How on earth did Jesus become God?. M A Powell: The Jesus Debate. Powell is recognised as a fair-minded reviewer of current trends, and this book summarises the views of some of the most influential scholars in the field (the Jesus Seminar, J D Crossan, M Borg, E P Sanders, J Meier, N T Wright). Professor E P Sanders, Duke University Jesus and Judaism and The Historical Figure of Jesus. One of the most respected and influential New Testament scholars. NT Wright, Oxford & St Andrews Universities: Simply Jesus. A simple summary by a prodigious historian. Craig Blomberg: The historical reliability of the gospels. Dr J Charlesworth, Princeton Theological Seminary (ed): Jesus and Archaeology and Jesus and the Dead Sea Scrolls. GW Clarke, The origins and spread of Christianity, in The Cambridge Ancient History Volume 10. WD Davies & EP Sanders, Jesus: from the Jewish Point of View, in The Cambridge History of Judaism Vol 3. Emeritus Professor E A Judge, Macquarie University, foreword to The truth about Jesus by P Barnett. Craig Keener, Asbury Theological Seminary: The Historical Jesus of the Gospels. Lee Strobel: The Case for Christ and The Case for the Real Jesus. Robert Van Voorst: Jesus outside the New Testament. Prof Geza Vermes, formerly of Oxford University: The Changing Face of Jesus and The Nativity. Prof F Watson, University of Aberdeen: The Quest for the Real Jesus. In M Bockmuehl. John Wenham, Oxford University: Easter Enigma. Prof M Borg, Oregon State University, is quoted in M A Powell. (Emeritus) Prof J Dunn, Durham University, is quoted in J Polkinghorne: Science and Christian Belief. H Koester is quoted in G Habermas. J A T Robinson is quoted in G Habermas. A. N. Sherwin-White is quoted in Wikipedia. J Wenham is quoted in G Habermas. N T Wright is quoted in M A Powell. Bede’s Library – A comprehensive and useful site with information assembled by a historian who is also a fair-minded christian and includes a variety of viewpoints. His summary of literature on the Jesus myth and the historical Jesus are especially relevant here. G Habermas: Why I Believe The New Testament Is Historically Reliable and Recent Perspectives on the Reliability of the Gospels. Excellent summaries of the views of christian scholars. Butler University: Scholarly Approaches to and Perspectives on the Historical Study of Jesus. A useful reference list. Wikipedia: Historicity of Jesus and Historical Jesus.